A good restaurant that can be overlooked because of hedges in front of the strip mall but once you find it you are in for a treat! I had been carrying a small newspaper clip rating the restaurant as one of the best for a Cuban sandwich so we decided to try it and was surprised from the minute we got there. The outside in the afternoon looks more like a takeout coffee place than the large, well appointed, comfortable restaurant inside. It was about 1:30 PM and the place was empty and stayed that way except for a guy who came in for a takeout order. Our waiter Javier was not only new to the USA, from Cuba, but seemed new to the restaurant business though he knew/did all the correct things from suggesting a few items, showing us the list of 8-9 different lunch specials, bringing our drink orders promptly, checking back to make sure everything was okay only making one mistake which was understandable. I did order the Cuban sandwich ($7.99) and Diet Coke ($1.79) while Craig had the Pork Sandwich ($7.99) and diet Coke ($1.79) both coming with fries. There was some confusion when we were served because I knew what I had in front of me was not a Cuban sandwich but it was corrected when we realized that Javier just put the sandwiches down wrong and it was hard just by looking at them to tell the difference! My sandwich was really good but I wish there had been homemade fries or the choice of another side dish but that's minor. Looking over their menu, divided between Mexican and Cuban dishes, all at reasonable prices, ranging from pork, chicken, seafood, steak, from fajitas to Arroz con Pollo all with appropriate side dishes. 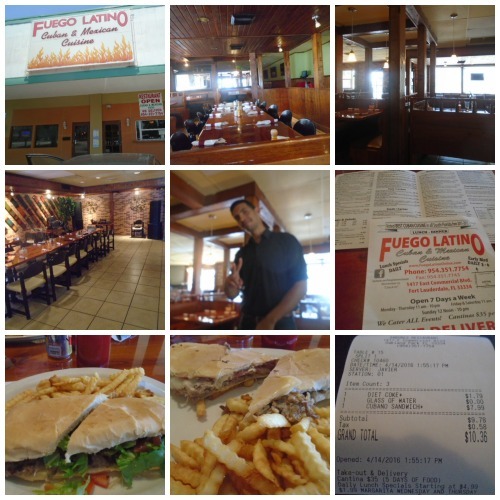 I hope Fuego Latino makes it because it has everything going for it as far as I could see when it comes to ambiance, a good looking, eager to please staff, a lot of free parking and one of the craziest tables at the front door alone worth the trip there! I would love to see what the frosted window in front of the restaurant looks like in the evening and I am planning to have dinner there soon, probably trying the fajitas. Oh, yes, even though we didn't expect, or ask for it, Javier gave us separate checks which weren’t necessary as the price was the same for both $10.36, including tax. 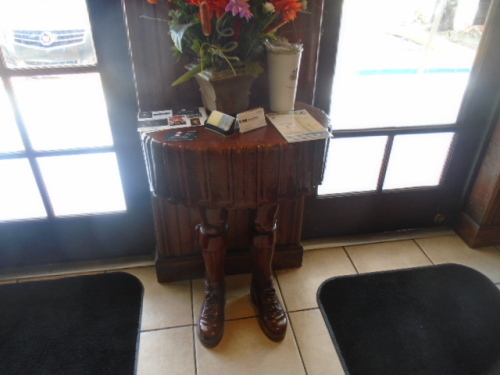 That little gesture earned him a bigger tip.